I've been reading nothing but Booker nominees for the last 8 weeks. I managed to read 8 of the 13 nominees and was lucky enough to finish the entire shortlist. It's been an interesting journey into many different worlds; from suburban Australia to a prison garden shed in Canada; from revolutionary America to jewish life in modern London; from the end of Jamaican slavery to airport bars at Gatwick; from backpacking in Lesotho to Egyptian grave excavations in the 1920s... Amazing how much thought has gone into all these works of fiction. New Competition! Signed Salman Rushdie! We are running a competition on our Facebook page. Price is a signed copy of Luka and the Fire of Life - signed by the very man himself. The Nobel Prize in Literature 2010 was awarded to Mario Vargas Llosa "for his cartography of structures of power and his trenchant images of the individual's resistance, revolt, and defeat". A few pictures showing our customers and the staff moving of the bookshop, the opening cermony and the first week in the new place. 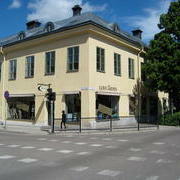 Next weekend the Uppsala shop is moving! We have been in our current location for almost 9 years and have now outgrown them. Sales are excellent (thanks guys!) so we feel this is now the right move for us. But don't worry! We're not moving far, the new place is 25 meters west of the old one; it's actually in the same building but on the corner. Bigger, better, but just as nice. The actual move will happen during next weekend, most of it during the Saturday. A lot of you have been kind enough to offer to come help out, which is really amazing of you. We do have the best customers. If you do want to help out, let us know beforehand so we can plan for food and such. So, wish us good luck and we rely on your forebearance as the start-up will undoubtedly be a bit messy. Barbara Kingsolver wins the 2010 Orange Prize! The american author Barbara Kingsolver has won The Orange Prize for Fiction 2010 with her sixth novel The Lacuna. "We chose The Lacuna because it is a book of breathtaking scale and shattering moments of poignancy". Daisy Goodwin, chair of judges.